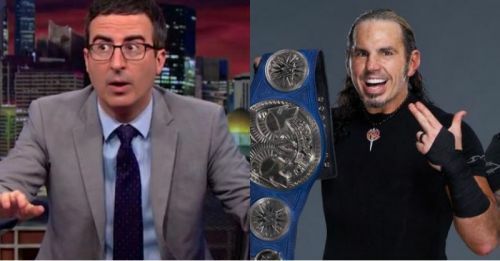 According to Wrestling Edge, in an interview with Fox News, Matt Hardy responded to John Oliver 's WWE segment. A couple of weeks ago, John Oliver did a piece on WWE on his HBO show, Last Week Tonight. He criticized the WWE in regard to their handling of WWE wrestlers, the independent contractor clause and others. WWE provided an official response through one of their representatives. It goes as follows. John Oliver is clearly a clever and humorous entertainer, however the subject matter covered in his WWE segment is no laughing matter. Prior to airing, WWE responded to his producers refuting every point in his one-sided presentation. John Oliver simply ignored the facts.The health and wellness of our performers is the single most important aspect of our business, and we have a comprehensive, longstanding Talent Wellness program. Other WWE superstars like The Big show also responded to John Oliver by saying that things have changed a lot in the industry. Moreover, the wrestlers know what they're signing up for. Matt Hardy, in an interview with Fox News had this to say about the John Oliver WWE segment. When I first started here, the locker room and everything was like the wild wild west then. The change that has happened in those twenty-plus years has been unreal. Now, the drug testing is very stringent. You have to be here and you have to be good and on top of your game. You have to be a professional. The physicals they do as far as cardiovascular and just checking you over and over… several guys they’ve caught that have had serious issues that could’ve been life threatening. He also goes on to say that the piece is unfair as it doesn't note the changes that happened within WWE and how things are handled now. Matt Hardy and Jeff Hardy won the WWE SmackDown Tag Team Championships. So, who will challenge them?